Fingerstock assembly. Internal contact assembly for tuning stub. Silver (tarnished). 1-1/4" thick. 5-7/8" OD +finger tension. 4-1/8" ID -finger tension. Made for Gates Harris. Fingerstock shield. Silver plated, beryllium copper. 1.778" outside diameter (1.7" inside diameter). 0.638" high. 3/8" center hole. NSN: 5960-098-5117. Instrument Specialties fingerstock with scotch adhesive backing can also be soldered. Use for RFI gasketing or tube / connector contacts. 6 fingers / inch, 25 foot total length. Beryllium copper. Strip is 3/8" high and 0.075" thick @ rest. Will compress to 0.018". Leader Tech fingerstock. RoHS nickel plated. 16" long. 0.44" high. Instrument Specialties fingerstock. 16" long. 5 fingers per inch. Beryllium copper. Adhesive back. 3/8"W, 1/8"H.
Instrument Specialties beryllium copper fingerstock. Sold by the foot. 1.2 lbs. Each roll in sealed bags with desiccant. Instrument Specialties beryllium copper fingerstock. Adhesive strip on bottom or solder in place. 5/32" cup height, 11/32" wide, 16" long, 4 fingers per inch. Instrument Specialties for Collins Radio. Gold plated beryllium copper fingerstock. Adhesive back. 5.5 fingers per/ inch, 16" total length. Tech Etch beryllium copper fingerstock. Made to slide on to edge of 1/16" thick or less material or can be soldered. 4 fingers per/ inch, 24" total length. Beryllium copper fingerstock. 5/8" wide, 1/4" x 1/8" bottom lip. Adhesive on 1/4" bottom ledge. Can be soldered as well. 11/32" wide fingers (3 & a sliver / inch). 24" long, 3/16" high. Rockwell Collins electrical contact fingerstock. 2 x 17 fingers, silvered. 1.42" x 3.81". NSN: 5999-00-918-4031. Electrical heatsink. Aluminum base, anodized. Copper fingers measure 0.453" x 0.122" x 4". Body measures 1" x 4" x 3/8"H. NSN: 5999-01-251-1308. Instrument Specialties beryllium copper fingerstock. Made to slide on to edge of 1/16" thick or less material or can be soldered. 4 fingers per/ inch, 16" total length. Instrument Specialities beryllium copper plated fingerstock. Self-adhesive strip. Similar to FS-16. 16" total length. 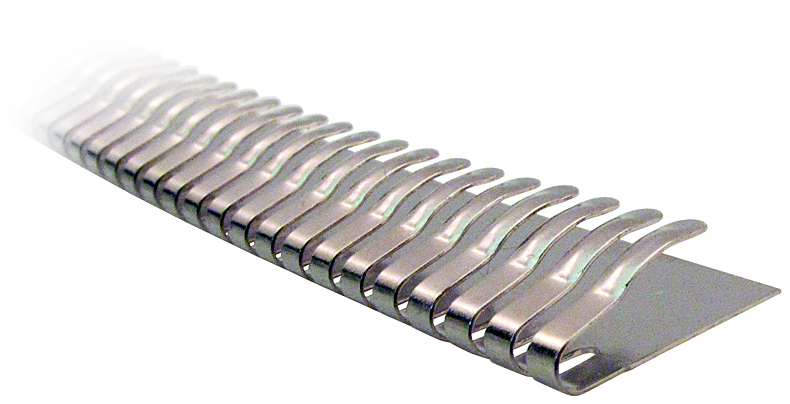 High compression fingerstock is 3/8" wide relaxed, 1/4" compressed. 4 fingers / inch, 16" total length. Beryllium copper strip 5/16" high. Mounting holes centered on each finger. Rivet or solder. Schlegel conductive copper nickel woven fabric comes in a 3/4" wide x 18 yard roll. Conducts both sides down to 0.8 ohm - cm Volume Resistance. 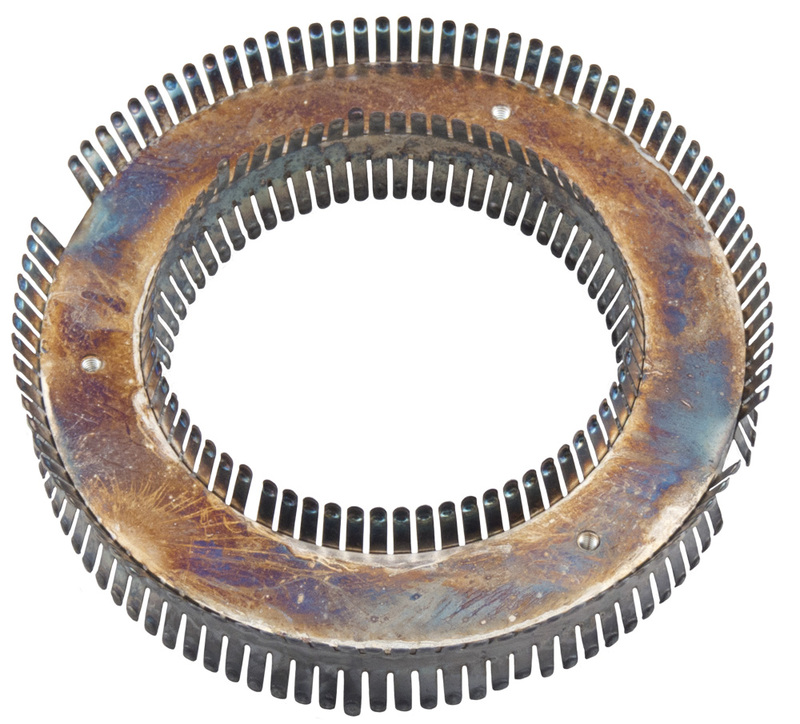 No change in surface resistivity after more than 100,000 wear cycles. We measured the thickness at 0.00725". Adhesive back is exposed when protective paper is removed. 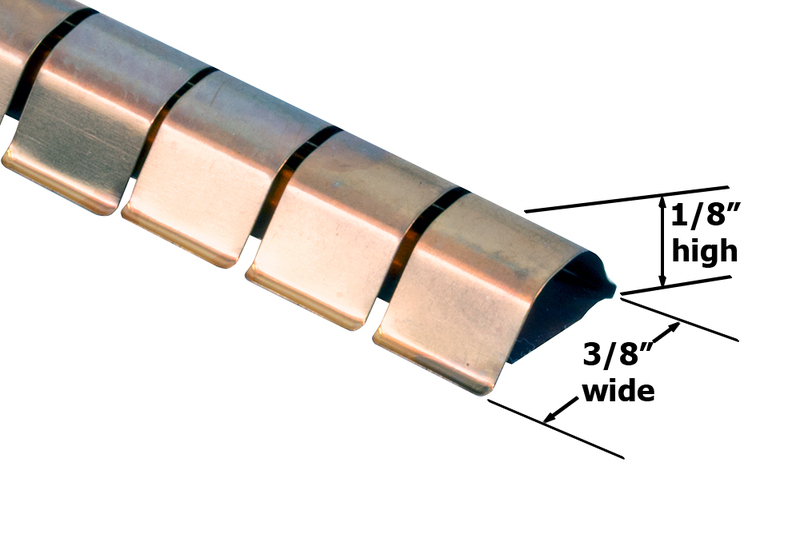 Wide, close spaced cad plated fingers, 4.5 per inch, 6.5" total length. Turns 1-7/8" diameter Inner diameter circle. 10 fingers / inch, 4.25" total length. Nickel plated beryllium copper. Fingerstock. 26C leaf tap rounded corners, 17 across. 3.095"L, 0.465"W, 0.1" rise over folded flange which forms a clip with 0.073"H gap to accomodate a flange of 0.043" - 0.073" thick. Bottom flange has 0.5" c-c, 0.08" x 0.128" mounting holes. NSN: 5999-00-024-9613. Fingerstock, electrical contact. Beryllium copper. 79 contacts on strip. 7-1/2" long, 0.438" wide, 0.156" high. 14 mounting holes, 1/2" c-c, 0.094" diameter. NSN: 5999-00-174-0060. Contact assembly. Inner and outer fingerstocks. 1.89" x 1.89" x 0.20". 1" x 0.4" x 0.19" bracket. 0.406" inside diameter inner hole. 1.89" outer dimensions of square body. NSN: 5999-00-969-9254. External ring contact. Copper, silvered. Made to slide over 1"+ diameter tube. 2" overall diameter, 1.025" inside diameter, 0.354" high. Made in 1953. NSN: 5895-539-0729. Internal tube contact ring. Gold. 3 mount holes on face. 2-56 @ 120º c-c (0.74"). 1.197" outside diameter. NSN: 5999-01-099-8439. 1.5" - 1.6" diameter tubing contact cap. Silver, beryllium copper. 0.685" high. 0.65" c-c mounting holes. NSN: 6115-702-7213. Silver fingerstock. Beryllium copper. 2" long. 0.2" high uncompressed. 0.1" high compressed. 5999-00-818-5367. Fingerstock with scotch adhesive backing can also be soldered. Use for RFI gasketing or tube/connector contacts. 6 finger / inch, 24" total length. Beryllium copper. Strip is 5/16" high and @ rest, 0.075" thick. Will compress to 0.018". 16" long beryllium copper strip. 5-1/2 fingers per inch. Rivet holes on 2-7/8" centers. 3/4" wide, 1/4" high, 130º arc. Solder too. Exactly as (FSS) FS-6 but 0.18" high, 3/8" wide, 16" long and 4 fingers per inch. Same physical layout as (FSS) FS-6. Instrument Specialties silver custom gasket shielding slot-mount fingerstock. 3 segment. Dimenisions: 23/32"L x 11/32"W x 5/32"H.
Instrument Specialties silver custom gasket shielding spring contact fingerstock. 2 segment. 14,500 available.